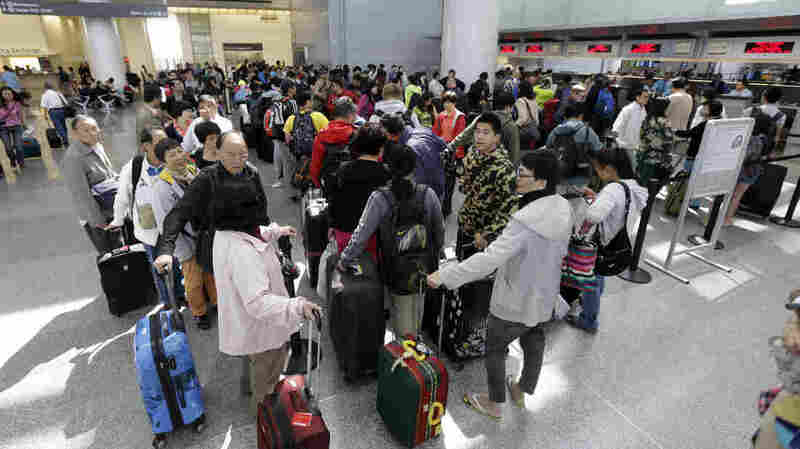 In The World Of Air Travel, Not All Passengers Created Equal After Asiana Flight 214's crash-landing in San Francisco, many weekend travelers were left stranded across the country. But the way airlines route such passengers to their destinations isn't based on how long they have been stranded, but rather on how frequently they fly and their "value" to the airline. Only a few of these passengers will be able to get flights out of San Francisco, depending on how many miles they fly and their "value" to the airline. When Asiana Flight 214 from South Korea crashed onto the runway at San Francisco International Airport on Saturday, hundreds of flights into that airport were canceled, stranding thousands of travelers at airports across the country. The Asiana crash came right in the middle of a holiday weekend, disrupting airline networks. And it occurred during a weekend when many flights were intentionally overbooked. What happened next to all those stranded travelers offers a revealing window into how airlines view their passengers. The fate of each traveler trying to get back to San Francisco depended almost entirely on their "status": how the airline computer systems calculated their potential future value to the airline. When there's a disaster or bad weather closes an airport, available seats are doled out based on a customer's status on the airline, not how far they have come or how long they have been struggling to get home. The scene inside Newark's United Airlines terminal Sunday afternoon bordered on chaotic. At Gate 113, a huge crowd of people pressed up against the desk trying to get to San Francisco. Half a dozen previous flights had been delayed or canceled in the past 24 hours. Imran Qureshi was stuck at Newark after flying in from the United Kingdom on Saturday. "There is no way to go home," he said. "I have been going to every flight — which leaves every hour — to see if I can get on a standby but apparently the airline has policies to overbook every flight. So if they have overbooked their flight, people on standby have no chance at all." The flight Qureshi was hoping to get on had close to 100 passengers waiting on the standby list and no free seats. United was bumping between six and 12 confirmed passengers off most flights from Newark to San Francisco on Sunday, adding to crowds in the airport. Serge Francois, from northern France, was one of the unlucky ones. "We are traveling for more than 20 hours now," he said. "We made a reservation three months ago now, so we would like to have a seat." Elizabeth James was flying with her mom and her husband, Jason. She and her husband were bumped. But her mother got a seat. It turns out there is a method to this madness: It's called customer relationship management — or CRM — and airlines helped invent it. Elizabeth and Jason James used frequent-flier miles to buy their tickets. Her mother paid full price. And in the eyes of the airlines not all customers are created equal. Each passenger's rights on each flight are determined by a complicated calculus. It includes how frequently they fly and how much they paid for the ticket in their hand. Frequent business travelers, like Demetrius Kondros, deserve special attention. These travelers generate tens of thousands of dollars a year in profits for an airline. But customers who buy a cheap ticket once or twice a year on vacation are almost worthless. So when there's a disaster or bad weather closes an airport, available seats are doled out based on a customer's carefully calculated status, not how long they have been struggling to get home. "When the crash [in San Francisco] happened, [United's Global Services program] actually called me," Kondros says. He was scheduled to fly to San Francisco from Barcelona. Without making a call they rerouted him into a different nearby airport. In 'The New York Times,' James Atlas writes about class struggles on airline flights. "They told me that I was rerouted via Munich, New York [and] Denver to San Jose," he said. When Kondros' Denver flight was delayed, United got him back on a direct flight to San Francisco, even though it was already oversold. Kondros jumped in front of passengers who had been stranded for days and likely pushed a confirmed passenger off the flight. But, Kondros flies more than 200,000 miles a year. Imran Qureshi does not, so he won't get home to San Francisco until Tuesday. United said it plans to resume a normal schedule Monday. It offered passengers a chance to change their scheduled flights without paying a fee. But for many who were stranded the airline offered little else. "This is just crazy," Qureshi said. "I also asked for a hotel. I said, 'Look, this is not my fault.' And they're saying, 'Well, it's not our fault either so we're not going to give you a hotel.' I have been paying out of my pocket for the hotel. And this is ridiculous. This is no way to treat people."